On January 2nd of this year I flew to Boston with my husband for the American Economic Association conference. It was my 7th time in Boston and the very first time I’ve been there with no marathon to run. Thus began my year of training differently. I’ve run the Boston Marathon in 1998, 2000, 2007, 2008, 2013 & 2014 but after four years of declining performance, I’m moving on. I started my fifth decade with a 3:10:09 run in Detroit, an Ontario 50-54 age-group best which held for 6 years. Then a Canadian 30K record at the Around the Bay Road Races. 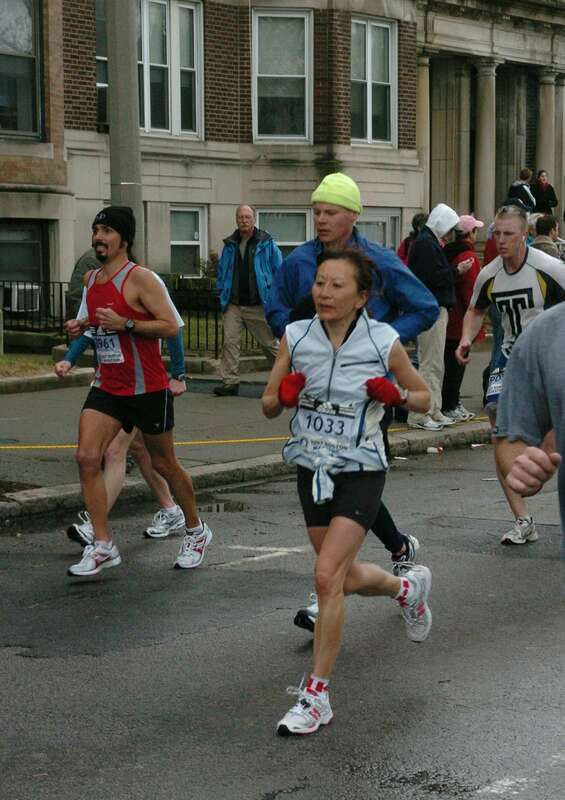 My run at Boston in 2007 at the age of 51 was a peak experience as a competitive masters runner. From the threat of the first-time cancellation of the Boston Marathon, due to a very nasty nor’easter, I placed 3rd in the 50-59 age-category. But from there the decline in my marathon performance has been dramatic. With my 6th decade on the horizon and a marathon time almost 1 hour slower (as shown on the table below) than 10 years prior, it was time to take stock. There is more to the decline than relative performance loss due to age. In 2014, I ranked 193rd in my age-group and since 2007 the age-group has been split, 50-54, 55-59. I did take three years off from serious training, but I think there is more to this decline than time off or the aging process. I give credence to one theory that a runner has only so many marathons in their legs. Why that could be, I’m not sure but I’ve been doing some research and there are theories that resonate – including changes at the cellular level in high-mileage runners. From my mid-fifties my body no longer responded positively to long-distance training stress. This article on the aging athletes and “The Law of Aggregate Miles” may be close to the mark. The silver lining is that in Toronto we have an excellent masters track club, the UTTC Masters Track Club whose coaches Paul Osland and Mike Sherar are turning marathon runners into track runners. I’ve been a member for a few years but have been see-sawing between track and marathon training. Going forward, I’m committed to a focus on track training. While training for marathons I was aware that aerobic conditioning slows the aging process somewhat while more intense training, over threshold is said to delay the aging process twice as much as aerobic training. So, a focus on intensity and the better conditioning value of faster running is not unwelcome and makes a lot of sense for the masters athlete. My track-only campaign got off to a rocky start last fall with an ankle sprain from which the by-product was plantar faciitis. This was my first injury since 1987. The plantar faciitis lingered through the fall, winter and spring. But, I was able to run some decent track times on 12-15 miles a week. This was a huge surprise to a one-time 80-100 mile a week marathon runner. But mixed into those 12-15 miles were mini-speed workouts with a 10 minute warm-up and cool-down on the bike. Finally, I feel on solid ground and have been able to build my mileage to 33 miles with the beginnings of an increased volume of quality running. One reason why I ran so many miles as a marathon runner was I felt that I had more speed than endurance. Others I’m sure, were able to run faster marathons with less mileage. Now, that I’ve set aside leg deadening mileage, I’m hoping for some good results on the track. I give myself a mental boost by harkening back to my adolescent years where I was once entered in a track meet as a high jumper and jumped close to a national level performance with no coaching and the antiquated scissor kick. Yes, I do have some fast twitch fibers. While athletic opportunities for women of my age-cohort were limited through our formative and university years, I cannot complain about the opportunities for me as a Masters athlete. UTTC Masters forms the biggest group within the Canadian team now competing at the World Masters Athletics Championships in Lyon, France. Twenty-five of our team members are taking part, including our world-class coaches and world-class masters trackster, Annie Bunting. 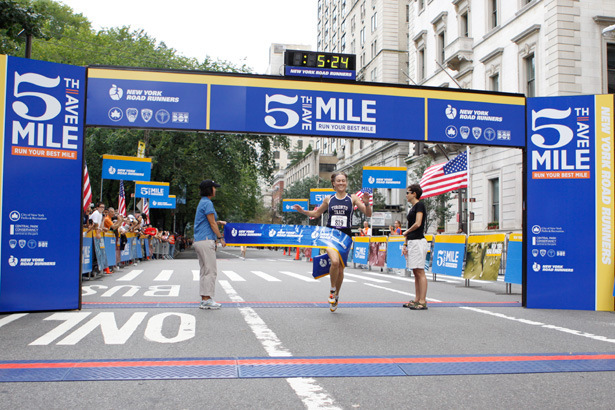 Annie has won her age-group at the Fifth Avenue Mile. The club gets to work out on the amazing new University of Toronto, Varsity Track snd has twice-weekly times reserved for us on the indoor track at the Athletic Centre as well. Annie Bunting wins her age-group with her trademark balletic form. The vision for the Masters Track team came from Carl Georgevski, Head Coach of the U of T Varsity Team who says, “Starting the Masters group has been one of the best desisions I have made. I simply love this group of highly motivated and passionate indiduals around me and my team.” The original U of T Masters was coached by former elite steeplechaser Zeba Crook, now professor at Carleton University. But first stop on the track training agenda is some strength training, AKA cross-country season. The Ontario Masters Track and Field Association has a great series which begins on September 27th with the Taylor Creek Park 5K. And speaking of that, if you have ever thought about joining a team, X-C season is the most fun time to join. Whatever your abilities or experience, you will love being a part of this hard-core running experience. Ultimately, camraderie is the biggest part of being on the UTTC cross-country team. Perhaps you too might want to train a bit differently this fall and will join me on the track or trails very soon! Learn more about UTTC Masters. Categories: Boston Marathon, Marathon, Masters Running, Masters Track and Field, Running | Tags: Boston Marathon, Marathon, Masters Running, Ontario Masters Athletics, UTTC Masters | Permalink.